The Bahrain International Air Show (BIAS) yielded deals totalling $9 billion including purchase orders for new aircraft. The agreements included deployment by express services and logistics provider DHL of additional aircraft in the region and deals for navigation equipment as well as an MoU for space science cooperation between the UAE and Bahrain. Contracts worth $1.1 billion to build a brand new terminal at Bahrain International Airport (BIA) were awarded. These included five agreement signed as part of the airport modernisation programme. Bahrain’s national carrier Gulf Air announced deals worth $7.6 billion including two purchases – 29 Airbus A320neo Family aircraft worth $3.4 billion and 16 Boeing 787-9 Dreamliners worth $4.2 billion. 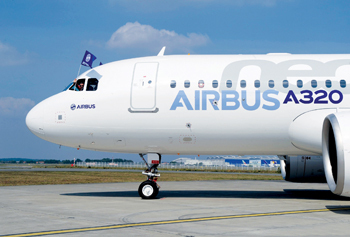 The Airbus order consists of 17 Airbus A321neo and 12 Airbus A320neo aircraft, of which 10 A320neo were confirmed in 2012. There was an upgrade to Gulf Air’s previous order of 16 Boeing 787-8s. Gulf Air acting chief executive Maher Salman Al Musallam said the orders will commence from the second quarter of 2018 and replace Gulf Air’s current wide-body fleet, providing the airline with future network expansion opportunities. The three-day show was held under the patronage of His Majesty King Hamad bin Isa Al Khalifa and organised by the Transportation and Telecommunications Ministry in co-operation with the Royal Bahraini Air Force and Farnborough International Limited (FIL). Airbus president and chief executive Fabrice Brégier said Gulf Air’s choice complemented the long-term growth strategy between the two entities. “The fuel-efficient aircraft will provide the airline with a higher operational efficiency and profitability while its wider cabins will open a new dimension of passenger appeal,” he said. Marty Bentrott, vice president for Boeing commercial airplanes sales, Middle East, Russia and Central Asia, said the Boeing fleet will help Gulf Air with superior fuel efficiency. DHL, the world’s leading express and logistics provider and official logistics provider for the air show, announced the addition of two Boeing 767 aircraft to its Mena fleet headquartered in Bahrain. “This marks a further step in the company’s continuous efforts to enhance its regional aviation network and expand its footprint with greater capabilities,” the company said in a statement. “The expansion of our Mena air fleet further demonstrates our commitment to investing in the region,” said Malcolm Macbeth, vice president of DHL Aviation Middle East and Africa. New navigation systems at BIA will undergo an upgrade that will help pilots land safely in difficult weather. This follows the signing of an agreement by Bahrain’s transportation and telecommunications ministry with Norway-based aviation technology provider IndraNavia for the project. Following another agreement, a containerised data centre (CDC) will be set up at BIA. It was signed between Bahrain Airport Co and Bahrain Business machines (BBM) and the project is expected to be completed by the end of the year. Bahrain and the UAE signed an MoU covering the exchange of information in the fields of space science, technology and applications as well as in policies and regulations. King Hamad visited the joint pavilion of the UAE Space Agency and the Bahraini National Space Science Agency during the air show and was briefed on the latest achievements of the UAE Space Agency, along with its current and future projects, especially the UAE Mars Probe, which will carry the UAE Mission to explore the red planet.